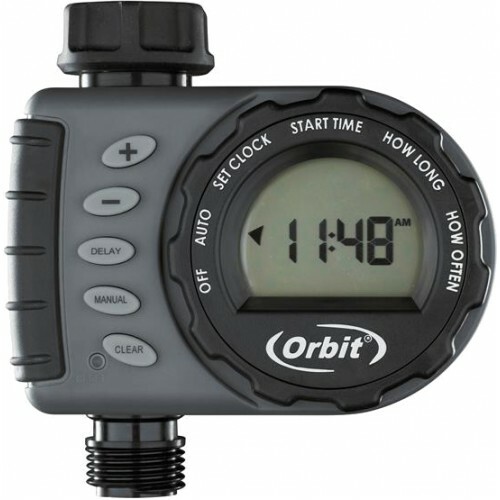 The Orbit Single Outlet Watering Timer will turn your garden tap into a programmed sprinkler system in minutes. No more dead plants because you forgot to water them. No more soggy lawns because you forgot to turn the water off. Just set the timer and go! With a large digital display and simple controls, programming is fast and easy. Built with high quality materials and water-resistant construction you can count on many years of dependable service. Install a tap timer to any standard outdoor garden tap and program it to water at your convenience. Program it to water during ideal times to minimize evaporation and save yourself time and money while making your yard lush and green. The timer has 6 settings: Off, Auto, Clock, Start Time, How Long, How Often. Featuring a rain delay setting, it is easy to conserve water if it rains. Press the manual button to instantly access your water without interrupting the timers programmed settings. There is no need for tools. The swivel connection is designed for hand-tightening and the battery case opens with ease. Plus, the timer retains the program while changing battery. These brass fixed pressure regulating valves are ideal for systems which require reduced & regulated pressure, like drip irrigation systems. For areas with high pressure.Plastic pressure reducers can't handle constant high pressure so the benefit with a brass pressure regulator is that you can put one on at the water connection for a dr.. These brass bib taps are available in different thread sizes and can be used all around the home, garden, or office block.They are a quality brass fitting made to Australian standards.The 15mm Garden Tap is the most common tap in Australian backyards. If you are unsure of the size of the tap you have or need, please see this link: How ..
Increase the number of individual outlets from a single tap and for easy control of watering zones just add a tap timer. Great for drip irrigation, garden sprinklers and hand held hoses to provide individual control. Solid Brass construction Ideal for 1 or 2 sprinkler hose tap valves or multiple hose connections. Convenient s..